Marc Myers writes daily on jazz legends and legendary jazz recordings and is a frequent music and arts contributor for the Wall Street Journal. 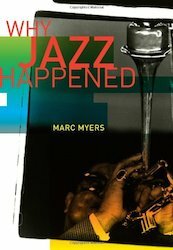 Marc is also the author of “Why Jazz Happened” (University of California Press). In 2012, JazzWax was named the Jazz Journalists Association’s “Blog of the Year.” – See more. For more from JazzWax, check it out here.